To get everyone ready for the upcoming cold-stun season I wanted to share with you some exciting news. 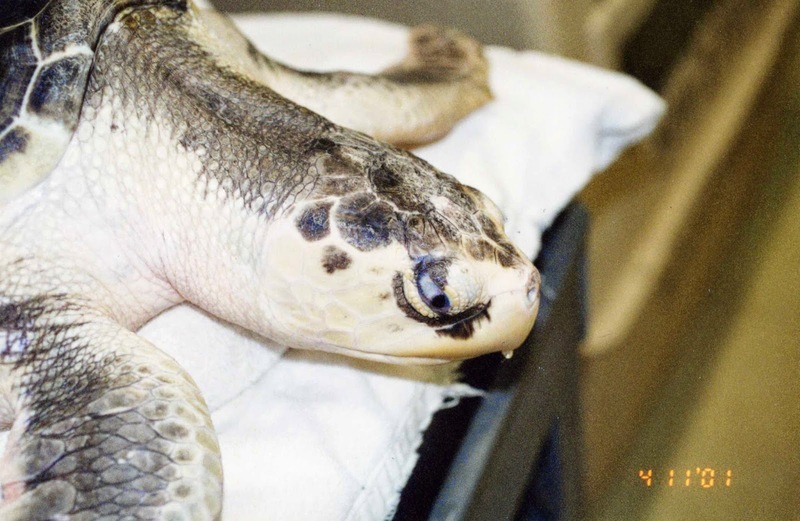 "Head Wound Harry" one of our 1999 Kemp's ridley sea turtles. 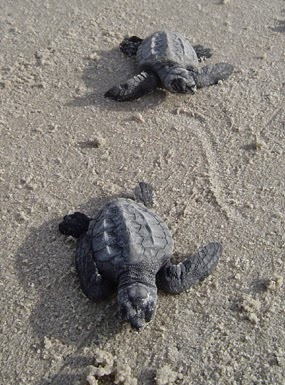 One of our 1999 Kemp's ridley sea turtles nested in Texas and is the mother of 103 baby turtles! 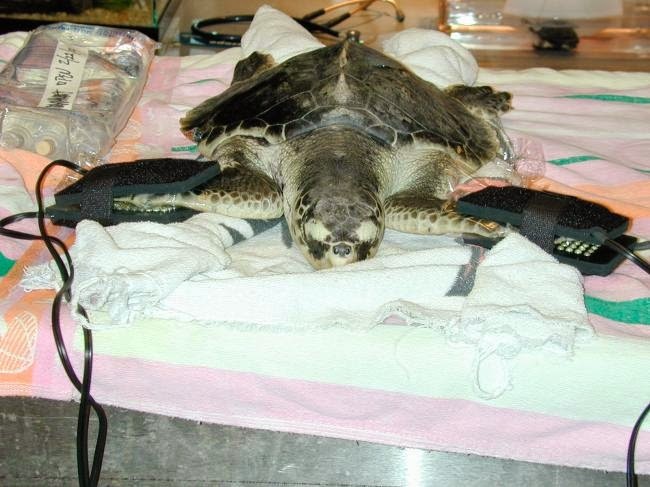 She was a patient from our previous record year (1999) of cold-stunned sea turtles. She arrived at the NEAq with a heavy epibiont load. After removing some of this load from her face, biologists discovered a head fracture and carapace wound. Due to the extensive head injury, the turtle was given the nickname “Head Wound Harry”, now revised to “Harriet” for obvious reasons. Due to the nature of the head wound, several diagnostics or procedures were run on Harriet. 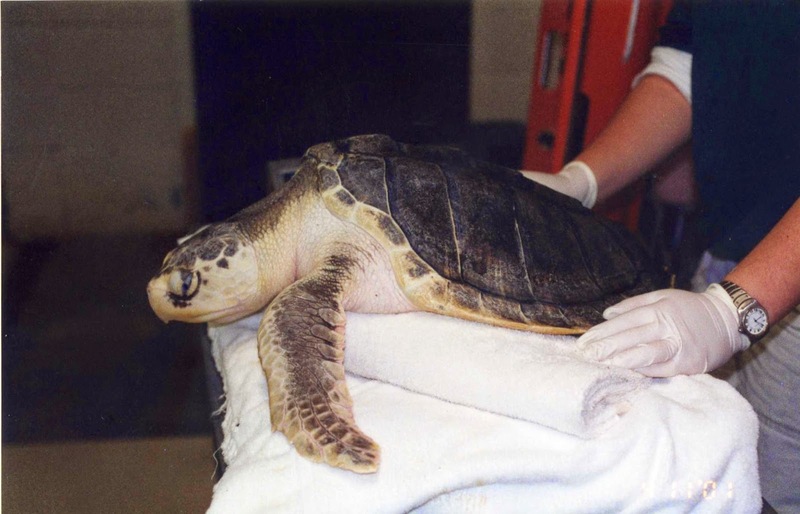 This was the first time some of the procedures had been done on a rescued sea turtle at NEAq. Since this turtle had a traumatic injury to the head. We wanted to make sure that the skull was healed prior to release. Sea turtles are exposed to high pressures while diving any defect could have posed a threat to its survival in the wild. This was one of the first turtles at the Aquarium to receive light therapy treatment. This type of treatment was a precursor to today's laser therapy. Both the above treatments were done due to suspected osteomyelitis (bone infection). The light therapy is used to draw blood into the affected region. Using a tracer radioisotope doctors can see the perfusion of blood into the bones. They can then determine where possible infections, cancers, even arthritis is occurring. One procedure that you have heard about before is PIT tagging. This is how we were able to confirm that the nesting turtle on Padre Island was our "Harry/Harriet". You can see the PIT tag for "Harry" in the left front flipper of this X-ray. This is how nest patrollers on the beach were able to determine this turtle was one of our rehab patients. 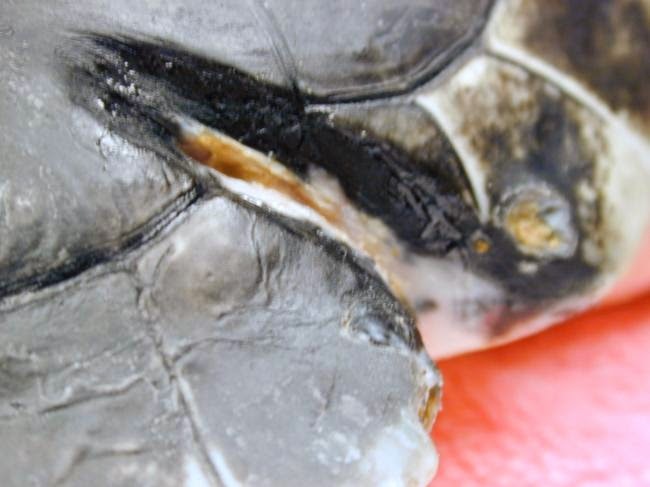 Interestingly, the PIT tag for this turtle helped shape policies for PIT tag placement on sea turtles in the U.S. A paper published in 2010 on PIT tag migration featured a series of radiographs specifically from this turtle. For those of you that are interested you can find the full article here. This is a corresponding fracture on the right side of the turtle's shell. It lined up nicely with the head trauma which, made us believe this wound was a propeller strike. 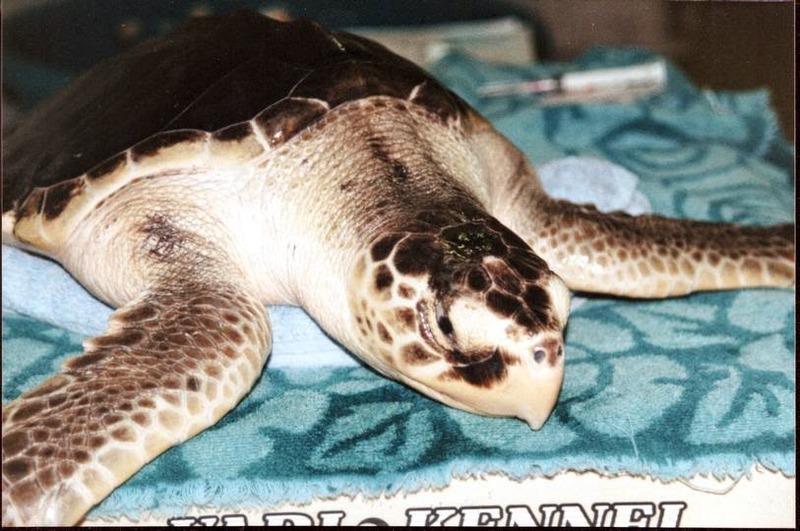 This turtle spent almost two years at the New England Aquarium for its rehabilitation. In order to make room for new admissions we had to send "Harry/Harriet" to Columbus Zoo in Ohio to complete her rehab. She actually flew in the passenger area of a large commercial airplane accompanied by a staff member. 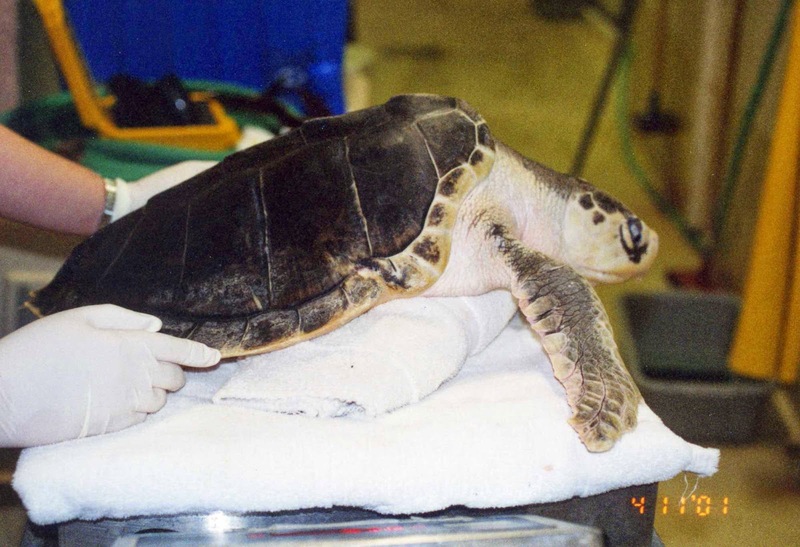 There she spent another two years before being transferred to the Virginia Aquarium for subsequent release in 2003. She then spent 6 years out in the open ocean, until finally, in 2009 she crept back up from the sea to lay two nests. One nest was on North Padre Island Texas where she had 64 hatchlings survive. Folks at the Padre Island National Seashore made the survival and protection of this nest possible. The other nest was on South Padre Island Texas where the folks at Sea Turtle Inc. incubated the clutch and had 39 hatchlings survive. Hopefully this is just the first of many more nesting turtles we find out about. When we do hear about them we will keep you posted! Thanks to those folks that took photos back in 99-01 and sent them to me. Specifically- Melissa Hoge, Kristen Dube, Alexandra Daniello, and Terry Rogers.